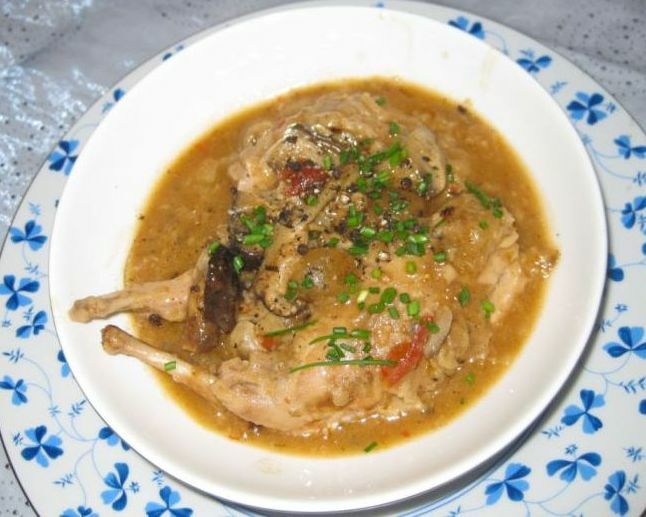 I have eaten rabbit many times but I have never cook it before. 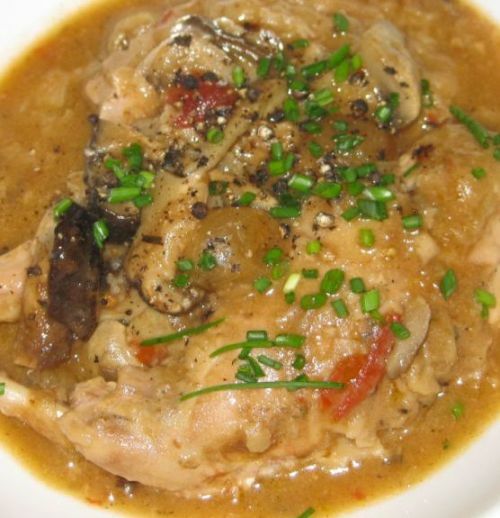 I wanted to try it out and serve something I have never done before at my dinner party! 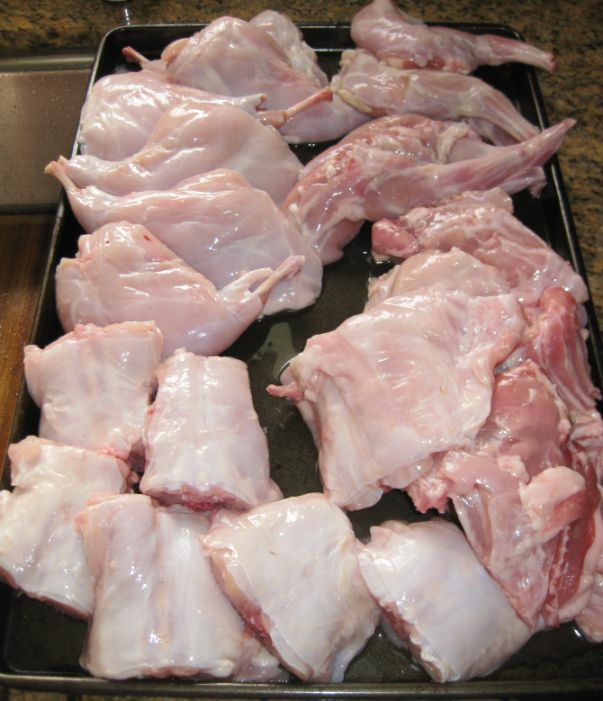 Rabbit is lean white meat and respond best to braising which bring out the silky texture and keep the meat moist. 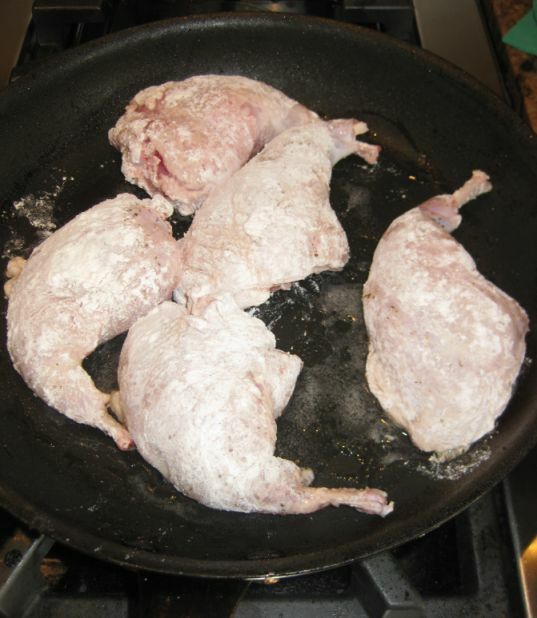 If not cook properly the rabbit meat can be pretty dry so I made sure to pick a recipe that will leave the meat moist. 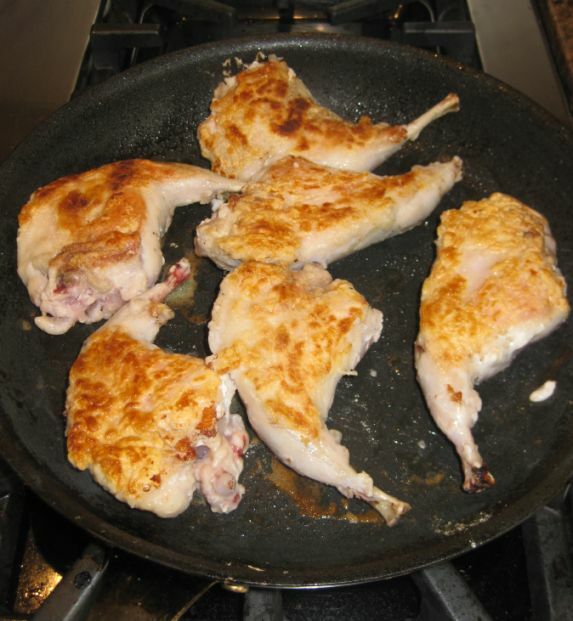 And NO, rabbit is not poultry and does not taste like chicken even though we have a tendency to compare all meet beside beef and lamb to taste like chicken. Perhaps because chicken has a mild and generic taste. 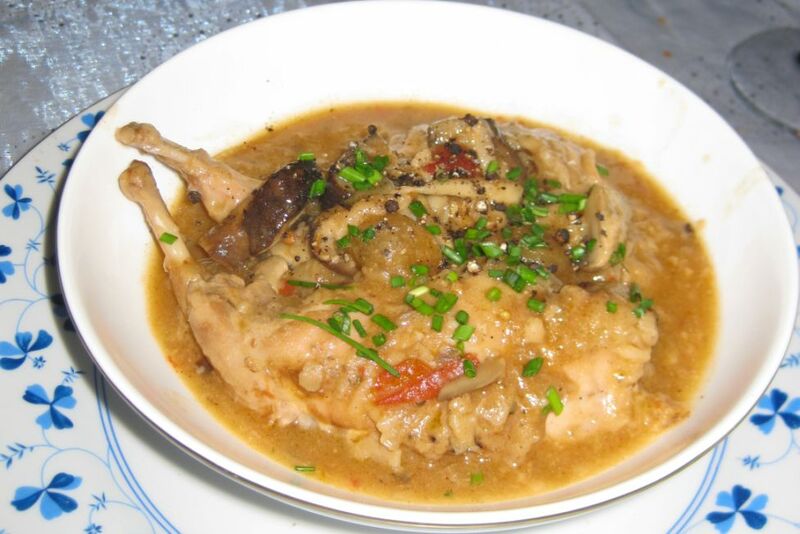 A beautiful braised rabbit plate. I have to say I was happy of the outcome of this dish. 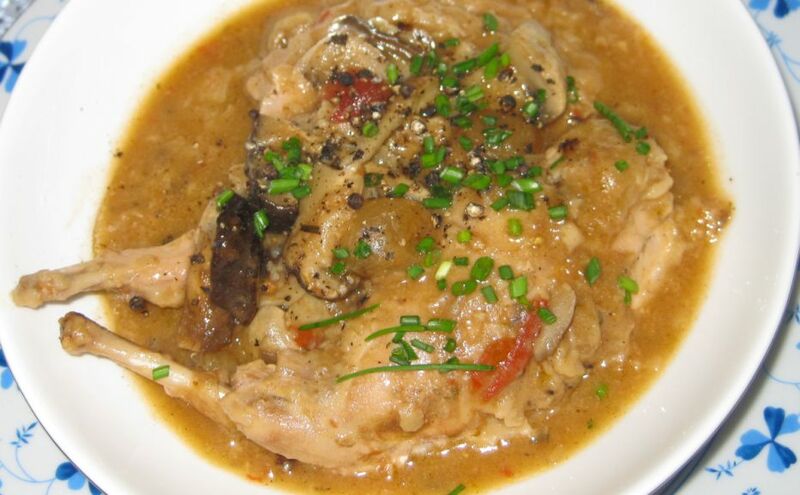 Close up look at braised rabbit. 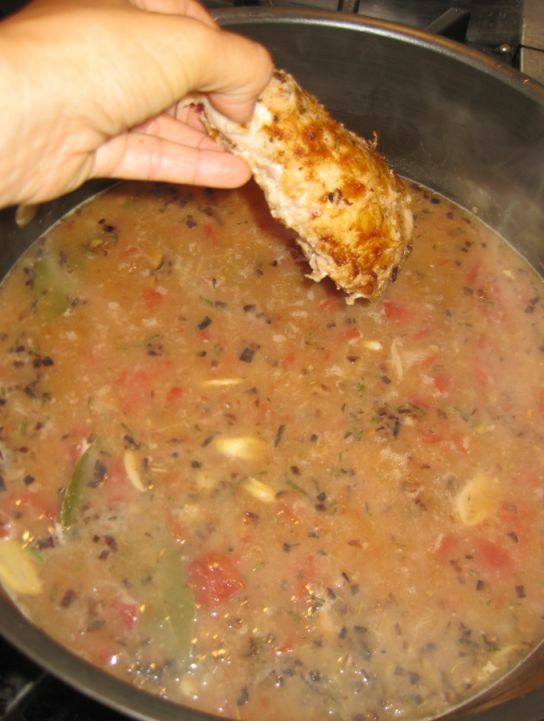 Note: I had to triple the recipe because I am cooking for a large crowd so the pictures below are for 12/14 people. Clean the rabbit. 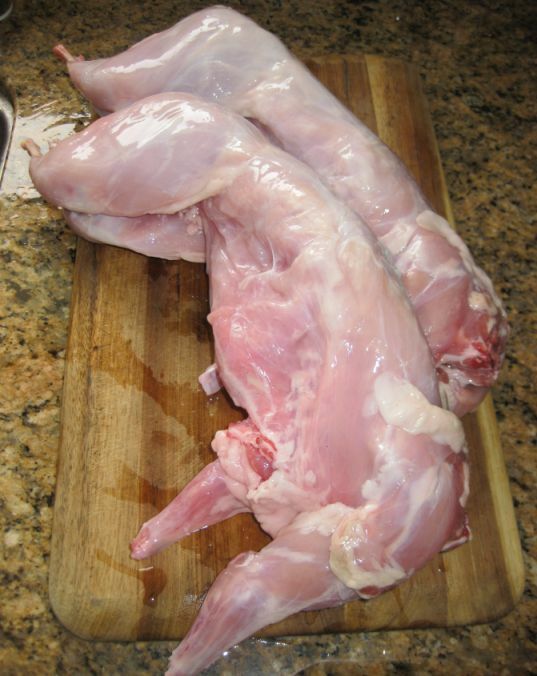 I bought 3 rabbits but I am only showing 2 because there are not enough space on my cutting board. 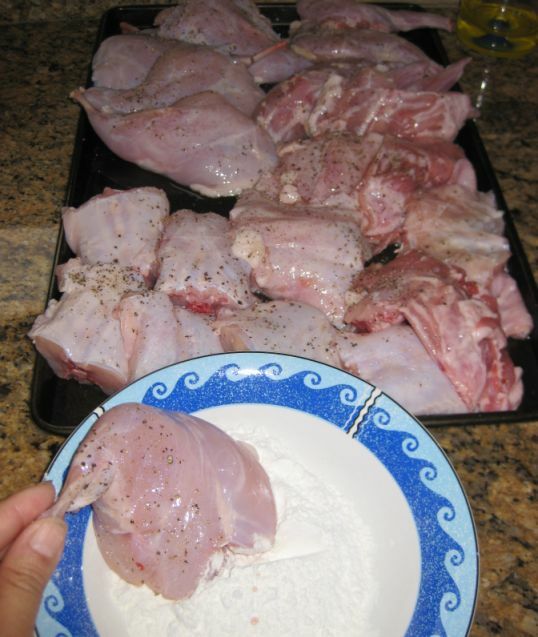 Season the rabbit with salt and pepper then dredge them in the flour. Heat 2 tablespoons of the oil in a pan over high heat. Sear the rabbit in the hot oil. Seared about 1-2 minutes on each side or until golden brown. 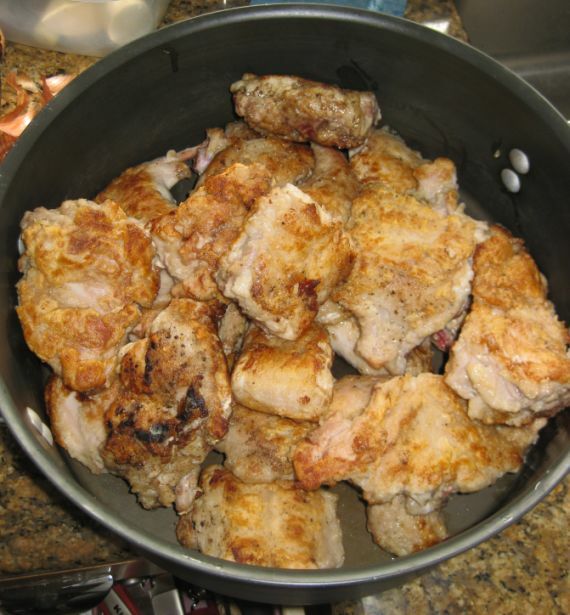 Transfer the seared rabbit into a large pot and set aside. 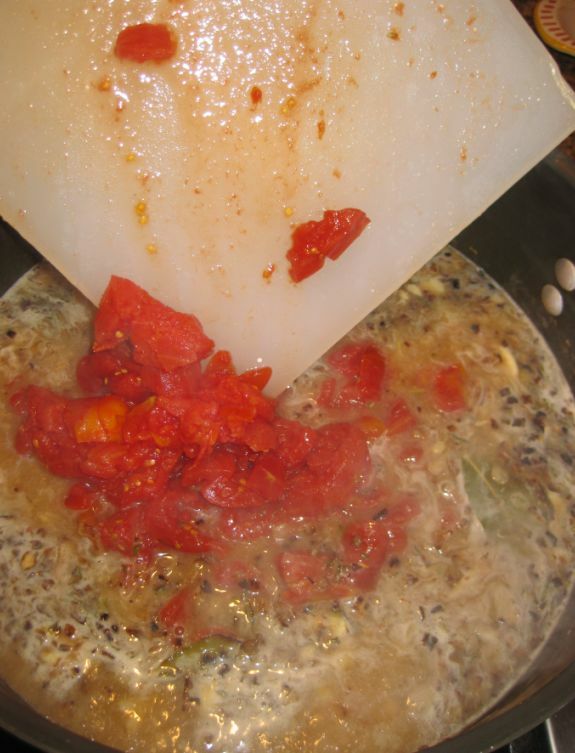 Reduce the heat to medium high and add the remaining 1 tablespoon of oil. 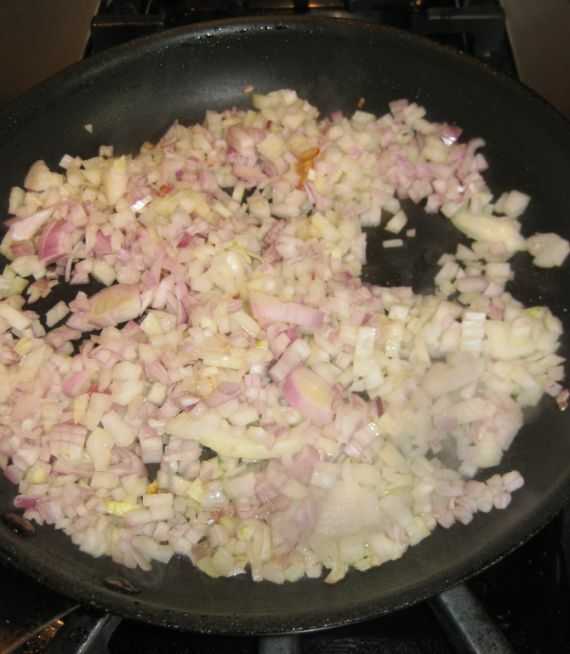 Add the onion to the pan. 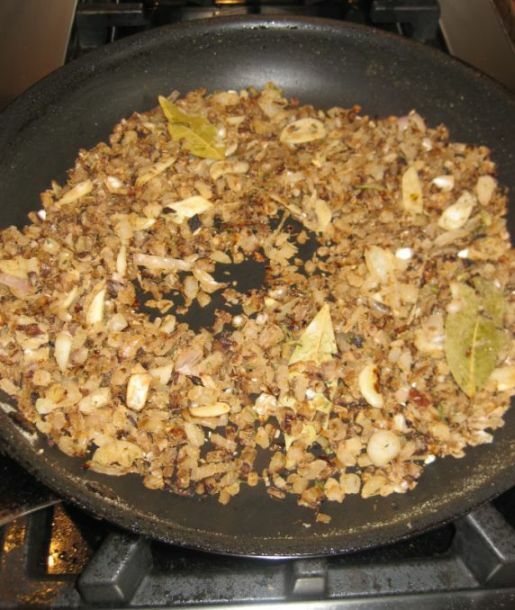 Sauté until golden brown about 4/5 minutes. 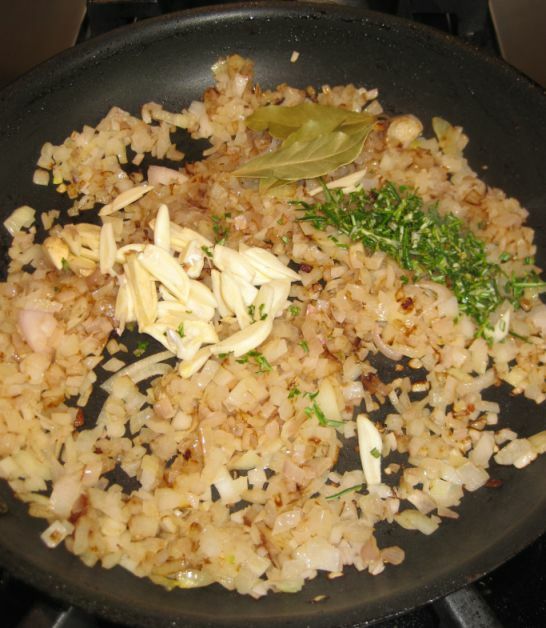 Add the garlic, rosemary, bay leaf, and thyme and continue to sauté until the garlic is aromatic. 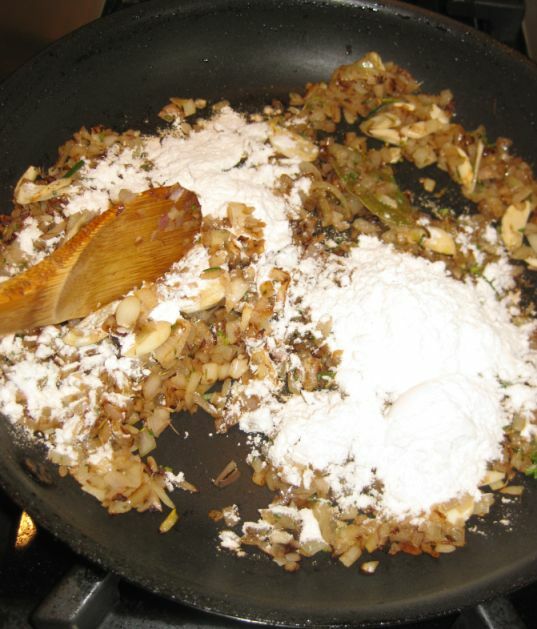 Add the 2 tablespoons of flour and cook. 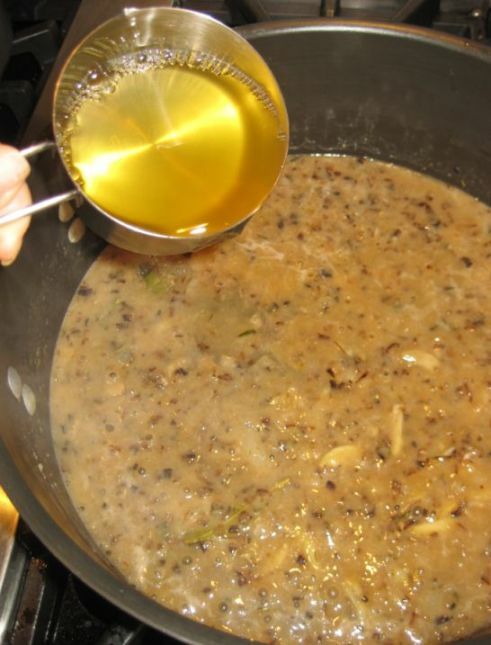 Stirring frequently with a wooden spoon to make a blond roux, about 5 minutes. Whisking well to work out any lumps. 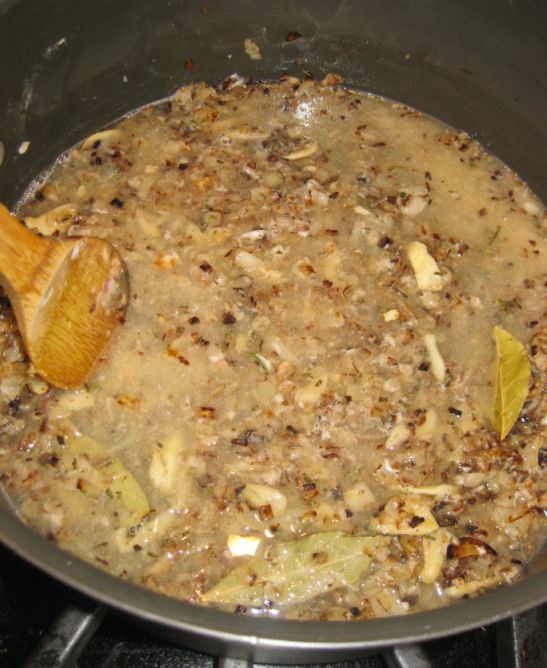 Add the broth and stir to combine and bring it to a boil. 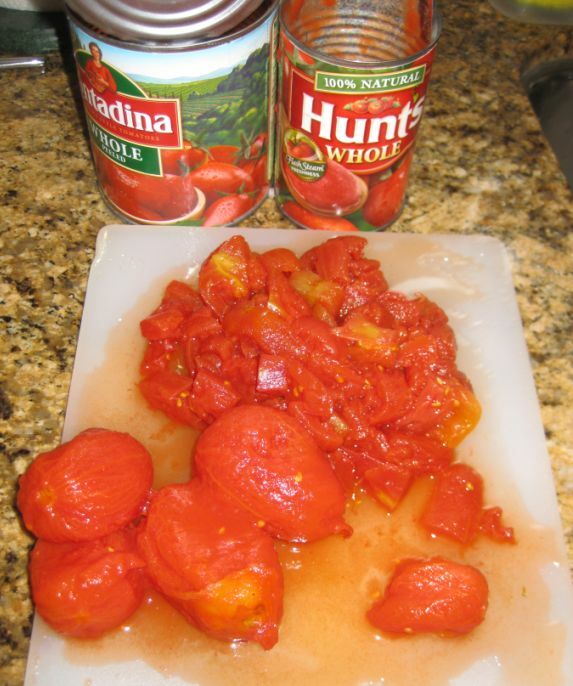 Cut the can tomatoes into dice. You can used dice can tomatoes if you you like. Add the tomato to the pan. Add the rabbit meat to the pan..
..and and bring it into a boil. 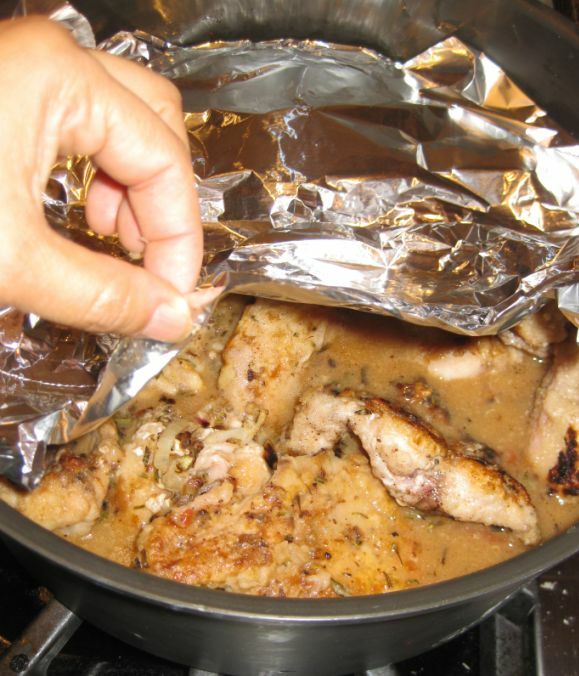 Put a sheet of aluminum of top of the meat and close the pan with a lid. 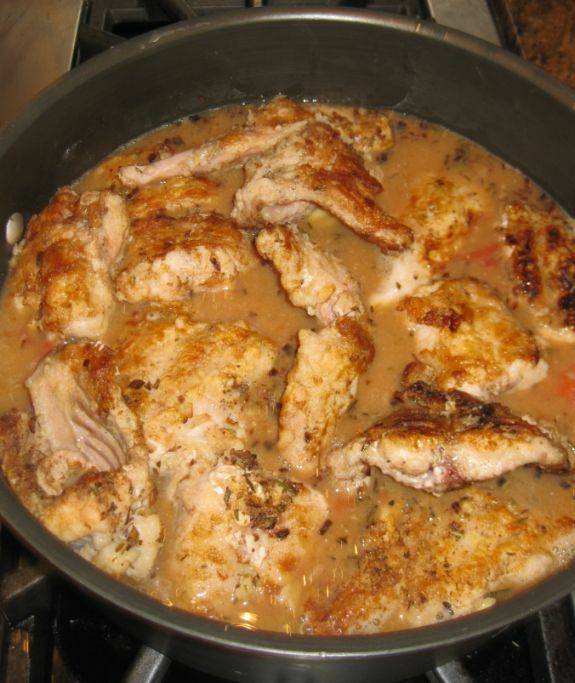 Braise it in the oven for about 45 minutes in a preheated oven at 350 degrees. 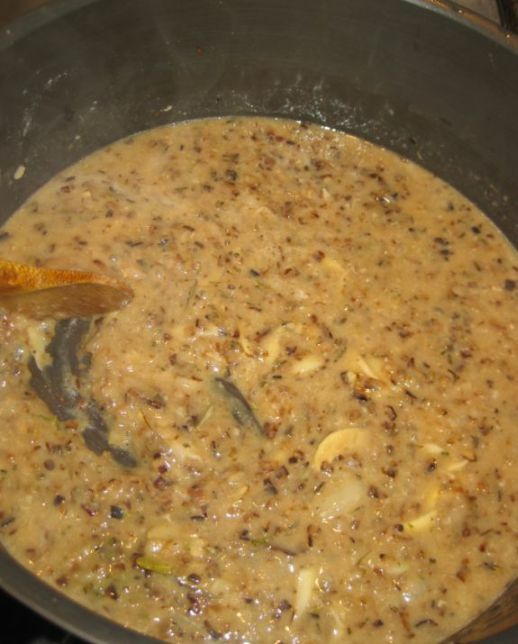 In the mean time you can sauté the mushrooms (any kind) and once the rabbit is ready just pour the mushrooms inside the pan and mix it together.